November has brought a dip in temperatures here in Chicago, just in time for our 3rd & 4th A/W releases at Atelier Jensen! I crave fitted wool suits this time of year, but a luxurious well-crafted, well-fitted suit is probably the number one most difficult thing to find in modernity in my experience. 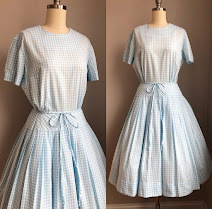 This is partly why I'm so excited to share our new skirt suit, as it is completely unique in today's setting and yet so classic in vintage styles. I drew inspiration from the perfectly fitted wool suits of the 40's and 50's, and the wool dresses which often had matching cropped jackets and boleros. We developed these ideas further, and created an ultra high waisted pencil skirt with a structured cropped jacket. 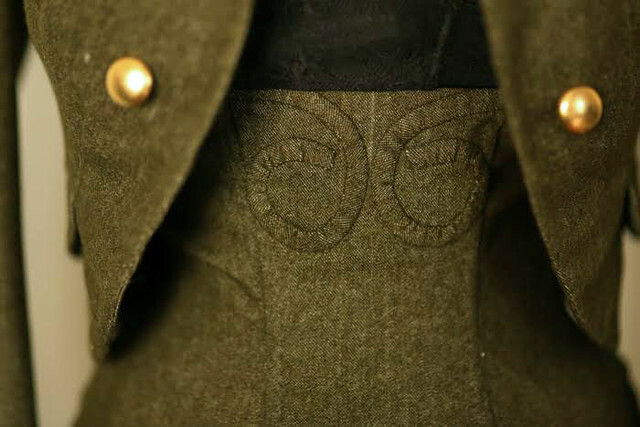 I wanted this combination to have a more dramatic feeling, and so I further took inspiration from the wartime uniforms by using a color combination of military green and opulent gold buttons. Our Skirt Suit makes the perfect chic and elegant daywear ensemble and it is crafted from 100% military green wool, 10 ounces in weight. The design is an extra high waisted pencil skirt, fully boned to add structure and sculpting the feminine form. 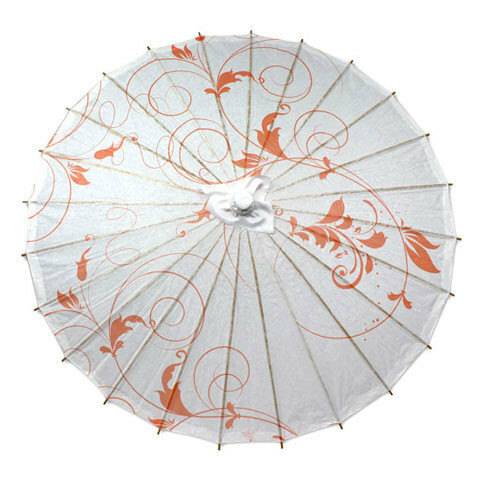 It is accented by a hand-decorated detail as authentic to vintage designs. The jacket is fully canvased with horse hair chest, and crafted to stay closed and keep it's shape without the use of buttons. It has Pagoda shoulders, hand-stitched lining and buttonholes as always (without sewing machines). 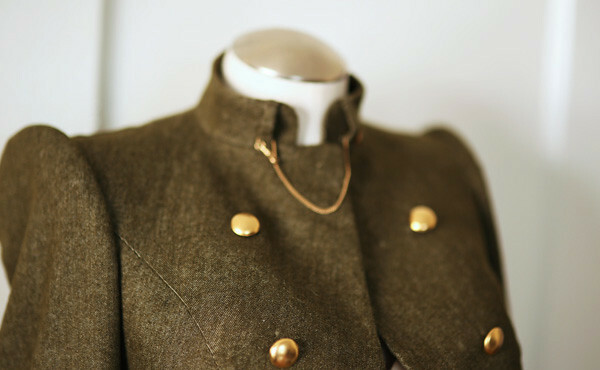 It is accented by gold buttons and a true vintage chain from the 1930's. Our skirt suit is accompanied by our own special Overwire Bustiere creation. Eric personally hand-forged the overwire using heat, and crafted it with handmade cups. It is 100% quality satin and fully boned with 5 total bones. We are so honored to have collaborated with one of our favorite milliners again, Milli Starr, with a custom hat designed exclusively for this suit. 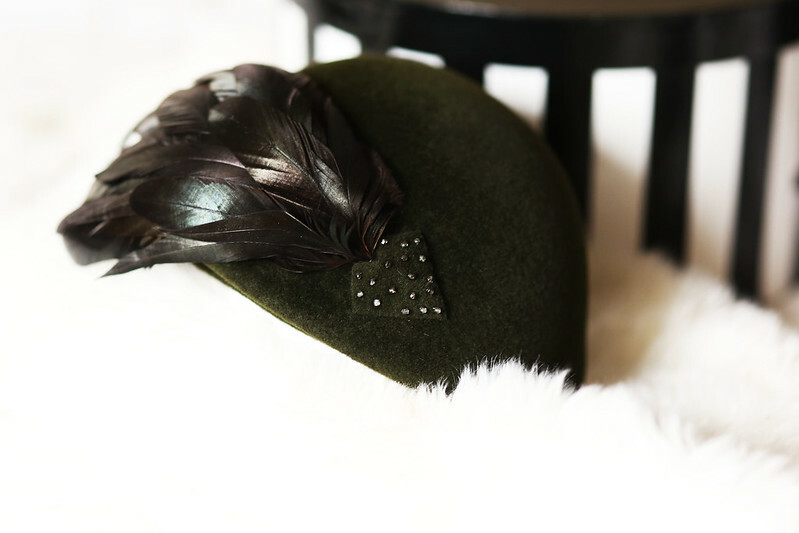 It is an asymmetrical beret created on a vintage wooden hat block in a luxurious felt in loden green, and hand-finished with millinery wire and grosgrain ribbon sweatband. The hat is trimmed with beautiful dyed Victorian coque feather plumage and vintage glass beads. This piece can be ordered with our matching olive bespoke wool suit, and can be ordered in other fabrics just like our suit. Upon delivery, it will arrive in a chic 12" hat box! Thank you so much for your continued support and love! This is my favorite so far! Such beautiful details. Is the zipper on skirt metal or plastic? What is the price for the jacket and a skirt? How long does it take to produce these if I decide to go ahead with the order? Thank you so much, I'm so honored you love it! The zipper is metal. We highly recommend personal fittings due to the exclusive nature and intricate bespoke work, for the perfect fit for each client. However there are some pieces we can create using your measurements. While the jacket would require personal fittings, this skirt is a piece that we can make for you with your measurements. Please do feel free to email us with any further questions at sartoriajensen@gmail.com. Such a pretty and sophisticated look! What a beautiful suit Rachel! I absolutely love the cut and detail of the skirt, especially the little swirls at the top! The bustier is just lovely and the hat and muff really set off the outfit! The jacket is beautifully made, so nice to see a good canvas structure and the shoulders are perfection! My Dad is an accomplished tailor so I've been brought up to appreciate beautifully hand crafted garments! Can't wait to see more from Atelier Jensen! Hello Kate, I'm absolutely so honored by your comment and amazed that your dad is an accomplished tailor! You sound like you really understand exactly what we are all about. Where did your dad study/work? Thank you so much for sharing with me and for your kind words. My Dad comes from a line of tailors, our family business has now been going for 5 generations and my Great Grandfather won awards. My Dad learned in Ipswich and London in the early 80's and currently splits his time between our shop in Scotland, Saville Row in London and traveling to clients. He's recently been as far as UAE and China! I'm really pleased for him as he has worked so hard and deseves the recognition! I'm so glad to see classically tailored garments as we rely too much on fast fashion nowadays! I'm obsessed with this dress and jacket. I love everything about it and the model looks amazing. If only I had those curves and somewhere to wear it. It's just lovely. 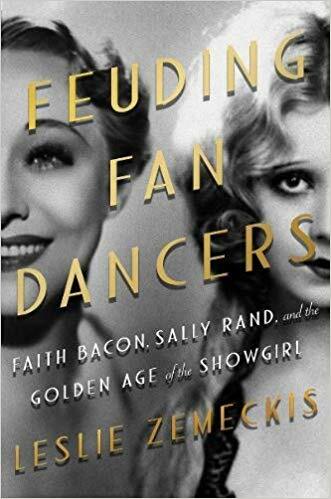 Thank you so much for reading, and I am so honored by your kind words! Ah Rachel, such a beautiful and unique outfit. You really inspire me to get more in touch with my feminine side (I'm more of a jeans and t-shirt kind of girl - I lack confidence to be daring!) and experiment with the vintage style I love so much.